Metro Rod & Tab Kit can be used on the outside of a shelf unit to protect product from falling off. Additionally, it can be used internally for dividing the shelves. 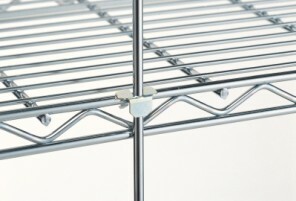 Furthermore, wire shelf accessories compliment your shelving and carts. From casters, shelf ledges, shelf dividers to plastic split sleeves, hanger rails and handles. Metro has the accessory to fit your need.